Since the introduction of clean intermittent catheterization as a way to drain the bladder, the technology of intermittent catheter products continues to advance. No-touch catheters, in particular, have become increasingly more popular. Many users prefer them because they’re easy to use and offer more independence. No-touch, or touchless, catheters may also reduce the occurrence of urinary tract infections (UTIs) and catheter-associated urinary tract infections (CAUTIs). UTIs can sometimes be an issue for those who perform intermittent self-catheterization. That’s why an easy way to cath that offers more sterility is at the top of the list of things to consider when deciding which intermittent catheter type is right for you. WHAT IS A NO-TOUCH CATHETER? No-touch catheters have been available on the market for several years. They are sometimes known as touch-free catheters or touchless catheters, but they are generally called closed system catheters or sterile catheter kits. Closed system catheters come pre-lubricated inside their own sterile collection bags and ready to use. Others may have a hydrophilic coating that is easily activated by sterile water to become lubricated. No-touch closed system catheters are unique because they have everything you need to cath in a single all-in-one option every time. Users can easily advance the catheter forward to insert without directly touching it. This minimizes the risk of contamination from the hands. The majority of closed system catheters come with additional insertion supplies like gloves and antiseptic wipes. They also usually feature a soft, flexible introducer tip to shield the tip of the catheter and help it bypass the highest concentrations of bacteria in the outermost section of the urethra. This potentially helps reduce the risk of UTIs. 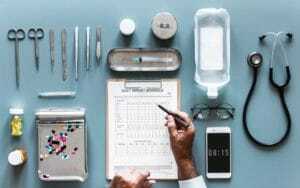 WHY SHOULD I USE A NO-TOUCH CATHETER? There are many reasons why using a no-touch catheter might be the best option for you, depending on your lifestyle, preferences, and needs. Many choose closed system catheters because of their overall ease of use, comfort, discretion, convenience, and travel-readiness. Of course, the reduction of UTIs is an added bonus. Touch-free catheterization shows to be quite effective at preventing catheter-associated UTIs in people with spinal cord injuries (SCI). Clinical studies demonstrated that the use of no-touch catheters is associated with a 30% UTI reduction. Medicare may also cover closed system catheters for catheter users who have had two or more documented urinary tract infections (UTIs) within a single year while using sterile straight intermittent catheters and sterile lubrication packets. In hospitals, both caregivers and patients have accepted the introduction of no-touch catheter systems and techniques quite well. Sterile use and no-touch catheterization have not been associated with higher costs. On the contrary, these techniques and products can actually reduce costs while saving time and reducing infection complications in general, according to clinical studies. When it comes to choosing a no-touch catheter system, you have a quite a few options, depending on your insurance coverage. Closed system catheters are the preferred cathing system for many, including people in wheelchairs, children, and those frequently travel, work, or go to school. People love their convenience, but they also like the reduced risk of infection. One of the most popular closed system catheters on the market is the Bard Touchless Plus kit, which features a patented catheter guide, allowing for better control during insertion. If your insurance policy does not cover closed system catheters (billed under HCPC code A4353), you may still be able to qualify for a hydrophilic catheter. 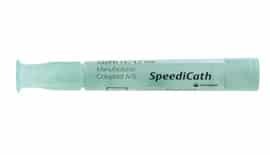 Hydrophilic catheters either come pre-hydrated and ready to use or easily activated by an included sterile water packet. Once it’s ready to use, the catheter stays optimally lubricated and offers a smooth insertion. Hydrophilic catheters work to minimize urethral friction, which can also help reduce the risk of infection. Most hydrophilic catheters are no-touch catheters, thanks to included handling sleeves that keep your hands off of the catheter tube. The popular GentleCath™ Glide, a no-touch hydrophilic catheter for both males and female, was created make cathing more comfortable. It also reduces the mess left behind by alternate brands of hydrophilic catheters. Intermittent straight catheters aren’t no-touch catheters. However, some cathing techniques can reduce the risk of contamination from hands, like using gloves and antiseptic wipes. Still not sure which catheter option is right for you? Contact us today and speak with a trained catheter specialist who can help you decide which intermittent catheter is best for your unique circumstances. Your health is too important to risk not using the right catheter product. Disclaimer: Please note that this post is not to be taken as medical advice. This information should not be used in place of the recommendations and medical advice of your professional healthcare provider. Sources: Bennett CJ, Young MN and Darrington H. PubMed. 1995. Bennett CJ, Young MN, Razi SS, Adkins R, Diaz F, McCrary A. PubMed. 1997. If you’re researching what kinds of catheters are available for men, you may be overwhelmed by the choices out there. Learn more about the three main types of catheters most commonly prescribed for males with our latest blog. 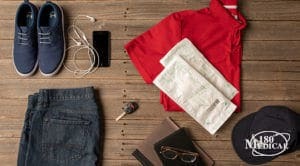 Pocket catheters are in demand, as more people want an intermittent urinary catheter that offers them discretion, privacy, and peace of mind along with comfort. Find out more about some of the main types that could work for you!